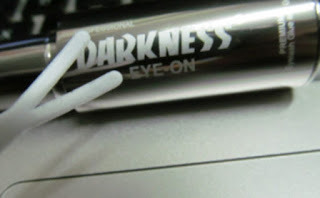 I've read a lot about the Darkness eyelash glue on various blogs and websites, and I finally manage to get mine. Really elusive brand indeed! I've been searching up and down for it, to no avail. I found it last weekend and was delighted. I only saw the black one, but in what I know there's also the white one. There are two different types of Darkness eyelash glue, and I got the brush type. There is also a squeeze tube eyelash glue. Personally I find the squeeze tubes very wasteful as I often press out too much glue by mistake. Brush types of eyelash glue give more control. Then again, it's a personal preference. In what I read, the tube one is actually less tacky than the brush one, but since I only got the brush one I have no basis of comparison. The white one can actually be used as an eyelid glue as it dries clear. Since I got the black one, it'll be hard to make it blend into the skin and eye makeup. The eyelash glue is very nicely packed, and comes with a velvet case. The tube is around the size of a typical mascara (roughly the size of the Maybelline Great Lash mascara). Once the eyelash glue is used up, the pouch can be reused to store other goodies. The pouch also contains the Y shaped plastic prong (Maybe I got the name of that tool wrong, but it's that plastic stick thing that is used for pushing back the eyelids) for the glue to be used as an eyelid glue. I don't use eyelid glue so that too is not very useful for me. I'm definitely looking forward to use the eyelash glue more and compare with others that I've tried. I've used the Pop lash glue, Ardell, Duo and a few random ones that came with the false eyelashes that I bought in the past. However none were exceptionally good and for the Duo one, it dries out too slowly. I sure hope it lives up to the hype, I might have just found my Holy Grail eyelash glue! Hi there! It is available on Amazon if you order online. In Singapore, it is sold at Sasa.